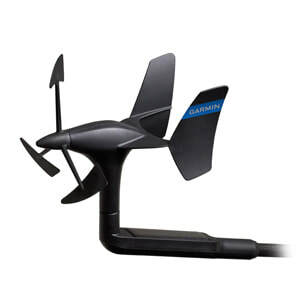 The gWind Wireless transducer, featuring twin-fin technology and design for more accurate TWS and TWA, can be purchased in 2 separate bundles or as a stand-alone device. An easy-to-install solution that eliminates running internal cables through a mast. Includes a WSI connection box that receives dedicated radio signals from the transducer and a GND™ 10 black box bridge that allows shared communication of critical NMEA 2000® data between the Nexus Network and Garmin compatible chartplotters. Available as 2 bundles; one with a GNX 20 and one without this marine instrument displayThe gWind Wireless transducer, featuring twin-fin technology and design for more accurate TWS and TWA, can be purchased in 2 separate bundles or as a stand-alone device. The bundles include a gWind Wireless transducer, GMI™ 20 marine instrument color display, GND 10 black box bridge and DST800 thru-hull smart transducer. One bundle also includes a GNX™ 20 marine instrument display.